Apple and Google have been competing in just about every field of technology for some time now - from maps to music - and mobile payments is no exception. 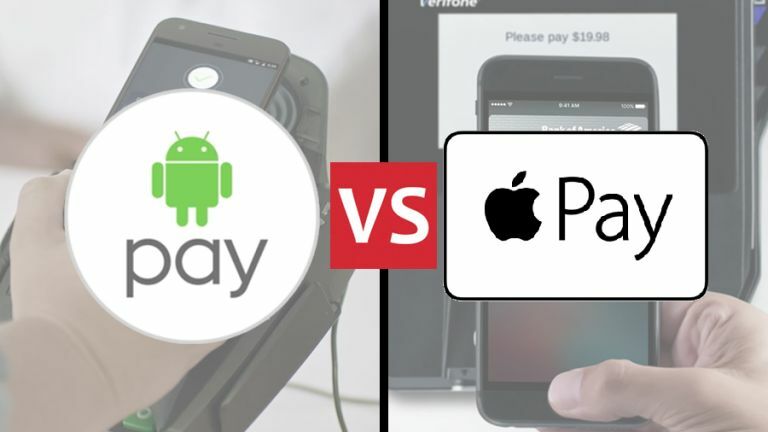 Here we're going to take a close look at how Apple Pay and Android Pay stack up against each other. Both have had a few bumps along the road, but with most of the major banks now on board, as well as thousands of retailers, the services are finally starting to pick up some steam. Here's everything you need to know about how the two platforms work. Apple Pay was announced back in September 2014 alongside the venerable iPhone 6, introduced by Apple in the same way it introduces everything - as a revolutionary new product that would change our lives for the better. It went live with iOS 8.1 and developers got to work building the technology into their apps. It then arrived in the UK in the middle of 2015 and continues to roll out to more countries today - France and Japan were two of the countries added to the roster in 2016. Because Apple and Google have to compete in every single area - those are the rules, apparently - Android Pay arrived on the scene at Google I/O 2015, as a sort-of-follow-up to Google Wallet. At its launch, you needed an Android device with an NFC chip and Android 4.4 KitKat as a minimum to get up and running with Android Pay. As with Apple's service, the roll-out has been staggered, with the US getting first dibs on it and the UK, Australia, New Zealand, Ireland and Japan among the countries added during 2016. As was the case when it launched last year, Android Pay still works with any device running Android 4.4 KitKat or above, provided it's got an NFC chip for the necessary wireless magic to happen. For the time being though it's not available on Android Wear, so you can't mimic Apple users by paying with your wristwatch. There are rumours - as well as hints deep within Google's code - that this is coming in 2017, but there's been no official word yet. As for Apple Pay, you need an iPhone 6 or later (the iPhone SE is included), or an Apple Watch paired with an iPhone 5 or later, to use Apple Pay in stores. Unlike Android Pay, Apple Pay works on the web too - Google still uses Google Wallet for these types of transactions - so you'll find it appearing on iPads and Macs as well. Both Apple Pay and Android Pay work in a select number of apps, provided the developer has added the functionality. Android Pay is reportedly coming to the web in the near future, but as with Android Wear, there's no fixed date for its launch at the moment. While they may have had their differences as they found their feet up, both Android Pay and Apple Pay are now very similar. First, you link a credit or debit card on your device - Santander, Halifax, Lloyds, HSBC, Natwest, TSB and Nationwide are among those supported in the UK right now on both platforms. Apple Pay does have a slight edge though: the Co-Operative Bank and Barclays are two banks that support Apple Pay but not the Android equivalent (or at least not yet). With that done, you just need to find a contactless terminal, or a store displaying an Apple Pay or Android Pay logo. Contactless is available in most major retailers in the UK now, even if the US is lagging behind in this regard, and all you need to do is tap your phone on the terminal as you would your actual credit or debit card. Both platforms can be used on the tube and both can be used to buy goods of any value - though some retailers impose the same £30 limit as contactless cards have. On Android Pay, you can make sub-£30 payments without unlocking your phone with some banks, while anything above that requires a PIN code or authorised fingerprint. Support inside apps and on the web is less common right now, for both Apple Pay and Android Pay, but we'd say Apple has its nose in front. Considering both Android Pay and Apple Pay are still relatively new, they're very slick to use, thanks largely to the proliferation of contactless terminals across the UK. As we've mentioned above, those in the US might have more difficulty finding stores where they can actually use the technology. Adding cards is straightforward whether you're using an Android or an iOS device, and while Apple supports more banks and more bank cards right now, Google has been quick to add new banks regularly. And while you might have misgivings about storing all your bank details on your phone, it's actually safer than using cards - unique tokens are generated each time, so the merchants don't get hold of your card details and can't clone them. Your payments can still be protected with a PIN or fingerprint, and with both Apple and Google offering remote kill services for their handsets, you can quickly lock a phone from the web if it should get lost or stolen. Apple Pay is just ahead in the mobile payments field right now - both in terms of the slickness of the tech and the number of supported banks and stores - but Android Pay is no slouch either. Whichever mobile payments system comes with your phone, you should find it a breeze to use, and it might even convince you to ditch your wallet for good.